While many wines now feature twist-off caps, there are lots of varieties that still use corks. If you don't consume the bottle at one time, resealing these varieties can be a bit more complicated. Fortunately, there are several methods for saving your wine to enjoy later. If the cork is in good condition and was removed with a traditional corkscrew, you may be able to force it back into the bottle with the right technique. Always examine the cork first to determine which end was inside the bottle. That's the end that should go back in, since the outer end may be contaminated with dust. Hold the bottle firmly on a stable surface. Tilt the cork slightly so that one side goes in before the other. Hold it so it is resting on the lip of the bottle. In one motion, twist and press down, letting the first part of the cork slide into the bottle about half an inch. Still holding the bottle firmly, press down hard on the cork with the heel of your hand. This will force the cork further into the bottle. 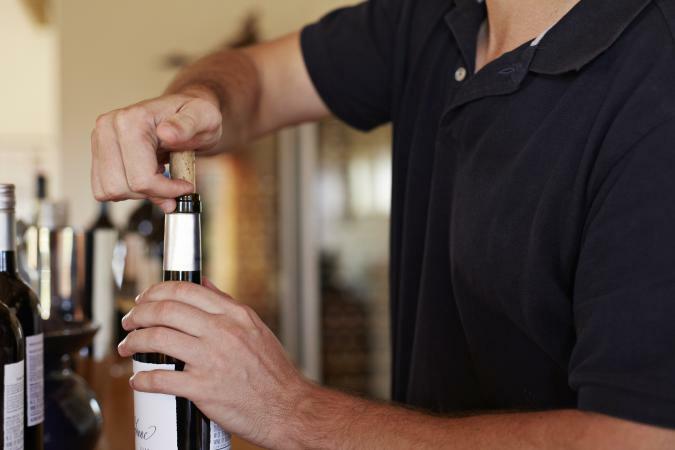 If you're having trouble getting the cork to slide back into the bottle with your hand, there may be too much friction between the surface of the cork and the glass bottle. You can reduce the friction by wrapping the cork in a small piece of waxed paper. Cut a piece of waxed paper that's about the same length as the cork and goes all the way around it without overlapping. Wrap the waxed paper around the cork and position the cork over the bottle at an angle. Hold the bottle firmly and gently push the cork back in, using a slight rocking motion. Avoid twisting, as this will wrinkle the waxed paper. Press down firmly until the cork is most of the way into the bottle. Sometimes, no matter how practiced you are at opening wine, the cork can crumble or break, leaving you with nothing to use to reseal the wine. If that happens, you can make a temporary cork out of paper towel, plastic wrap, and tape. This is only a temporary solution until you find a cork or a wine stopper, but it will work in a pinch. Tear off a piece of paper towel and fold it to be about two inches wide. Starting at one of the short ends, tightly roll the folded paper towel in on itself until you form a cork shape. Check the size against the bottle to confirm it will fit and trim some off as needed. You want it to be just a little bigger than the neck of the bottle. Tape the end of the paper towel to secure it. Wrap the entire thing in plastic wrap, using more tape to secure the ends. Now position the paper towel cork over the bottle and push and twist simultaneously, working it into the bottle. Continue until the bottle is sealed. Champagne and sparkling wine generally come with tapered corks that won't fit back in the bottle, no matter what method you try. However, there's still a way to reseal these wines. Save the cork from a previously opened bottle of non-sparkling wine. Because this cork isn't tapered, you can use it to seal the sparkling wine. Position the cork over the neck of the bottle, taking a firm grasp of the wine. Push the cork smoothly down into the bottle, twisting it slightly as needed to get it inside. Something to keep in mind with sparkling wine, however, is that many people feel it tastes better if the cork is left out. You can even insert a spoon in the neck of the bottle to help keep it fresh. No matter what you do, remember any method of resealing wine will not actually preserve it for longer. For that, you'll need a wine dispenser that keeps air from getting to the wine. Once the air has been in contact with the wine, it should be stored in the refrigerator and consumed within a few days. Still, knowing how to reseal wine is handy for when you need to transport it or keep it fresh for a little while.